"the uncertainty in financial markets has made the prospect of realising an appropriate value unlikely"
British Land were asking £1.7bn and at the time this Kübler-Ross inspired graphic appeared here. 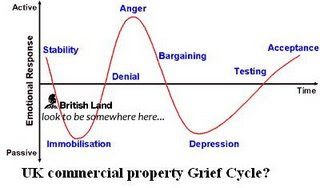 As many others at the time also observed it seemed clear enough that the commercial property shock was just beginning. So cut-a-deal-while-you-can looked an apt move. Instead, British Land went counting on market forbearance to right things and fetch them 2006's prices (in exactly the same way banks across the globe are counting on regulatory forbearance today to fetch them something like the fair values at which they are carrying various dung piles). Time has now run out on that strategy. Last week British Land managed to sell a half interest in Meadowhall for £588m. This implies a total value of £1.18m, 30% less than what they wanted 16 months ago. Interestingly, it is also only 85% of the value the center was being carried at in the interim accounts. I say "interestingly" because the market was informed by CEO Stephen Hester in February 2008 that the firm had "taken a hatchet across the board” to carrying values. A small, cuddly and possibly rubber-edged hatchet it seems. Now, it's fair at this time to assess if British Land has actually made money (at least in terms of capital gains) with Meadowhall rather than constantly harp on about certain aspects of their PR. They acquired the center a decade ago for £1.07bn. In real current money that's circa £1.25bn. Well, you can work it out from there. What is bothersome, and I realise this is puritanical, is the praise heaped upon the CEO Stephen Hester for his stewardship of the company, a tenure encompassing the miscalculation - and I think that is a more than fair label - of the aborted Meadowhall disposal. The recent deal, by new CEO Chris Grigg, provides only £170m in cash and came mere days before the launching of a rights issue of £740m. The new chief, I would suggest, is paying for the immobilisation/denial of his predecessor (now to be found in the role of a very well-paid civil servant running the Royal Bank of Scotland) in October 2007. Course, the official word is that they are not in any distress whatsoever - the cash call simply enhances a strong balance sheet and positions them to take advantage of the marvellous market opportunities appearing everywhere. Proving the counter factual is, of course, not possible. Yet the view that selling in late 2007 instead of holding out would have been financially superior bears much scrutiny.